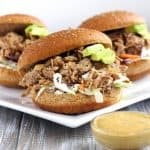 These slow cooker pulled pork sandwiches have a chipotle kick and a creamy, smokey avocado ranch sauce. 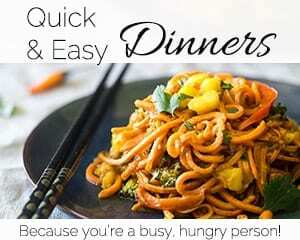 A quick and easy, kid friendly dinner that makes great leftovers! Yes, that this has a really long title. But that is not what I was going to say. 2. It’s so insanely easy that you could do it with your eyes closed. Except, if you’re going to do that, please make sure you peek a little once you get to the part with the food processor. I lost my finger tip in a food processor battle once. True story. Side note: I am typing this with all 10 tips in tact. It grew back. You were concerned. I know. Anyways. 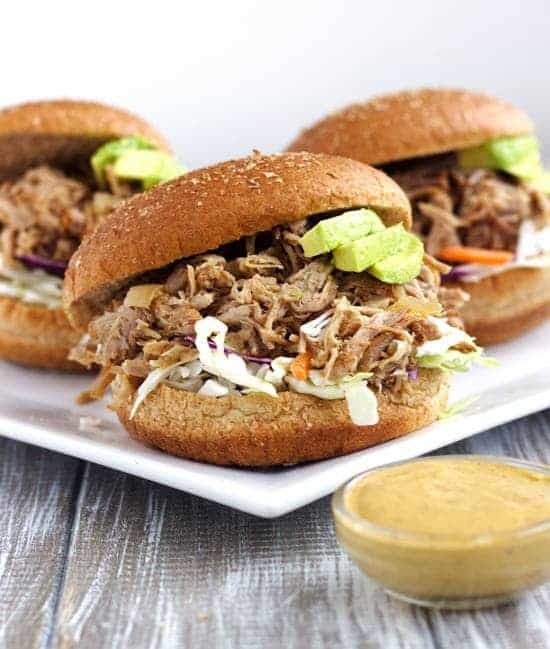 Pulled pork with creamy avocado ranch sauce. Right. So, really all you gotta do a little mix-up-the-spices dance, sprinkle it on some pork to give it some pizzazz, and then stick that baby in your crockpot or slow cooker, if you call it that, and go watch “The Bachelor.” Not that I am excited that it’s Juan-uary or anything. If you watch this show, that I do not watch (read: I do), you will know what I am talking about. Re-visit the little oinkster 6-10 hours later and, VOILA, dinner for you…and about a million other people. 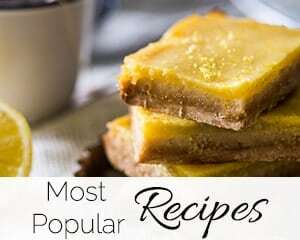 This recipe makes a lot. But, that’s ok because it freezes ah-may-zingly. Hello quick, hubby pleasing lunches that I don’t have to put any work into. Yes puhlease. 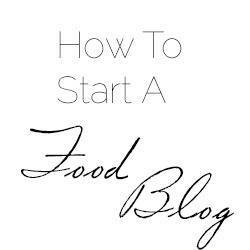 Oh my dear, there is a reason that you are the nurse and I am the food blogger. Although, I do try to self diagnose all my ailments so, technically, I am kind of a nurse? I guess that Web MD helps me though, so I can’t take all of the credit for my self diagnosis skillz. 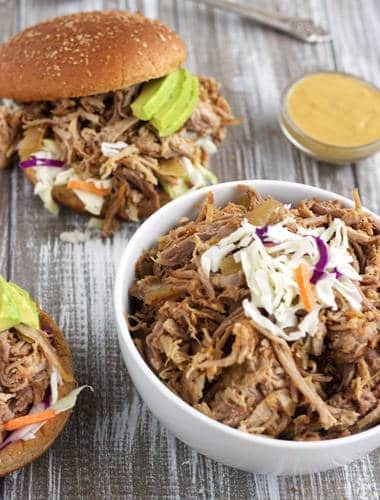 This slow cooker pulled pork comes out SUPER tender and insanely easy to shred. You could be all dainty and proper and use forks to shred up this bad boy, orrrr you can be uncivilized, like myself, and just get all up in thur and use your hands. Use your hands. You know you want it. It’s 4 bazillion times more fun. 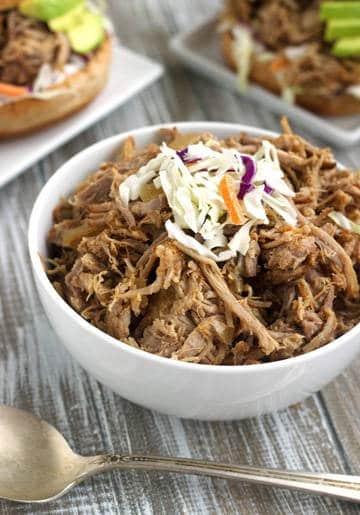 Once you’ve shred, shred, shredded that slow cooker pulled pork you can blend, blend, blend up that saucey goodness. Words are more fun in threes, don’t you think? Now, this is the time when you want to open your eyes and peek a little. Sharp blades + fingers + closed eyes = no bueno. Just throw all the necessary ingredients in there, hit that blend button, and hello creamy-delicious-sauce-that-is-begging-to-be-poured-over-pork-and-absorbed-into-a-big-chunk-o-carby-goodness. You like it. Side note: I tried to make this healthier by going all healthy cobb salad on this slow cooker pulled pork, and using Greek yogurt and subbing the Ranch dressing for Ranch dressing powdered mix. Do NOT do this. Unless you like things to do not, in any way, shape, or form, taste like Ranch dressing. Blech. Yo’ taste buds will not be pleased with you. 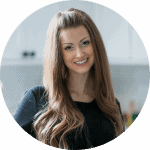 Now that you’ve got all the components made, done all the various (and required) dances, throw those those babies on a nice, whole wheat bun and call it yum-in-your-face. This sauce, you guys, just gets eaten up by the bread which makes for a very pleasant mouth-ular experience. And, Mr. FFF? He ate his words. Literallly. 3 1/2 - 4 Lbs Pork shoulder excess fat removed. Slice the onion and mince the garlic and place it in the bottom of your crock pot. Pour in 1 cup of water. Cut any huge, visible chunks of fat off your pork shoulder and then rub it all over with the spice rub, until it is evenly coated. Once the pork is cooked, strain the liquid out of the crock pot and place the solids (which is made up of the onions and garlic) back into the crock pot. 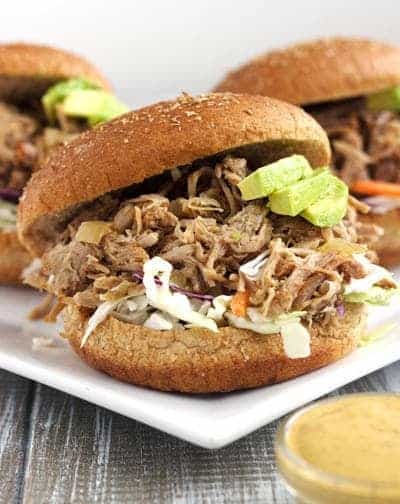 Serve the pulled pork on a whole wheat bun, topped with coleslaw mix and lots and lots of chipotle sauce. It’s been far too long since I’ve crocked and oinkster and these sandwiches are making me yeeeeeeern for pulled pork goodness! 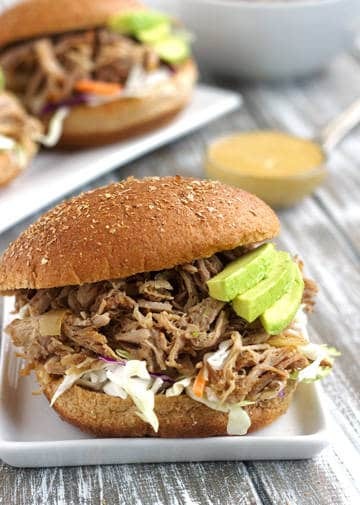 Men crack me up about food…they tend to get concerned when you pull the ol “crock pot chipotle pulled pork with avocado ranch sauce and a side of holy crap, this is the most amazing thing ever” I think it’s a lot for them to digest, but when it comes down to it, they digest it goooooooooood! I promise I won’t Greek yogurt the ranch sauce. YUM! You need to change that girl! It’s time to crock it up! I think you are correct about your thoughts on men…at least they come around in the end! I am fascinated by this avocado ranch sauce! Pulled pork must have smelt so good! Awesome photos! 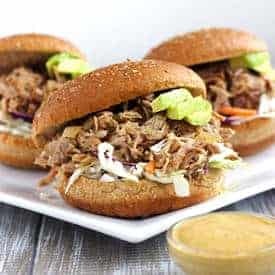 Chipotle pulled pork with Avocado ranch sauce sounds the bomb! I totally agree with you let him stay in his lane lol 🙂 I love meals you can throw in the crock pot and enjoy later.. What a lovely meal Taylor..
Just found your blog! Lovin’ it so far 🙂 and that pork sounds like HEAVEN in ma’ mouth! Can’t wait to try it out! These photos are so great Taylor! And I LOVE pulled pork! Oh and words in threes? Definitely the best way to say them! 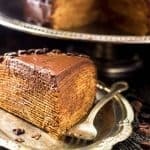 I love everything about this recipe!!!! This here shredded pork looks mighty tasty. Yes, sometimes less is more, but there are other times (like these) where flavors come together and create something so very delicious. Um, your finger, ouch! I’ll leave my eyes open. Pinned! Ohmygosh. I can’t believe you lost your finger tip in the food processor! How scary and painful. I have flashes of something like that happening to me all the time, or my hand getting pulverized in the garbage disposal. Arghhh.. Anyhoo, on a lighter note, these sandwiches look ah-mazing! I love the chipotle and avocado and ranch and pulled pork. All of it!! Oh man, I have those kind of flashes all the time! I hope you never have to go through the pain girl! Love the crockpot and those pictures! The shredded pork looks divine! I’m just curious about how avocado ranch dressing tastes. But well, I will know how tasty it is when I try it this weekend! these looks so yummy! i think my hubby would love love love them =) and crockpot is for sure the way to go! 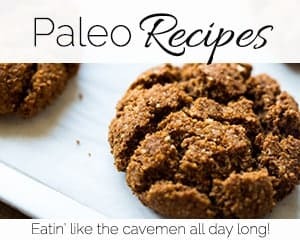 Have been loving the crock pot lately, especially with all the Paleo stuff I have been making. 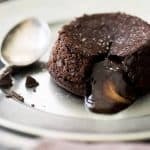 Takes the time element out of the picture, make a little bit and throw it in the crock pot! WIN! 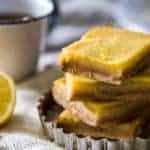 🙂 These look perfect for a superbowl party, totally pining and sharing on social media Tate! 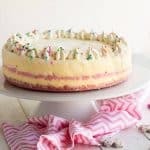 Loving the recipe and the pics! YUM! Pulled pork + avocado + a big carby hamburger bun??? Dinner heaven. You really nailed this time Taylor. I like these burgers though… I bet they’re happening on Sunday dinner yeah! Hahahah hamburger bum. We’re 5. I have been teetering on the edge of buying a crock pot and I think this recipe pushed me over. GAH! 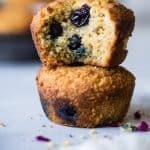 Those look incredible! The more flavors the merrier in my book. There is no teeter, there is only do. That was my Yoda impression. Buy a crock pot girl, you will NOT be let down! HAHAHA Google to the rescue eh? LOVE IT. Okay 1. PULLED PORK. Seriously the greatest kind of meat around. 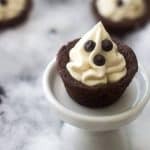 I need to make theseeeee! 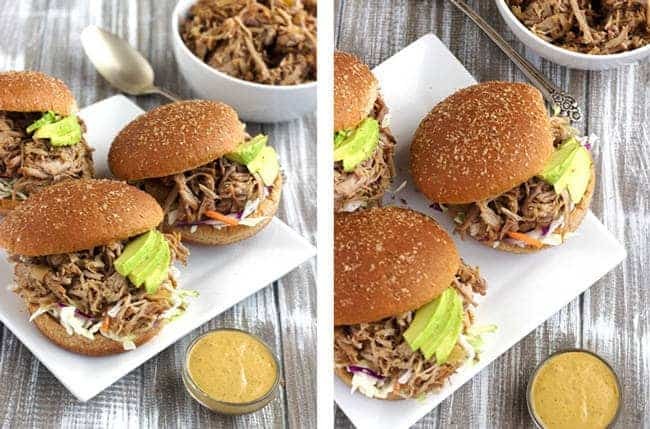 Pulled pork in burgers has to be one of my current obsessions; hopefully I’ll get around to trying your version! 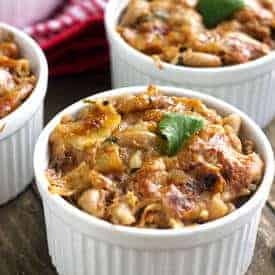 I am all about slow cooker meals so this is perfect! Seriously, all I can think of is GET IN MY BELLY!!!! Tee hee!! 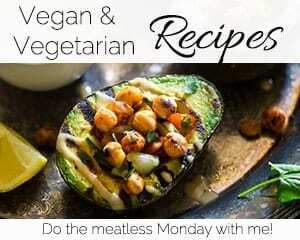 🙂 I’m adoring that avocado ranch sauce!! Alright, got this in the crockpot now. Cannot wait to try them out, the house smells amazing thanks to all those wonderful spices. The hubs is really looking g forward the them, I’ll let you know how it turns out! 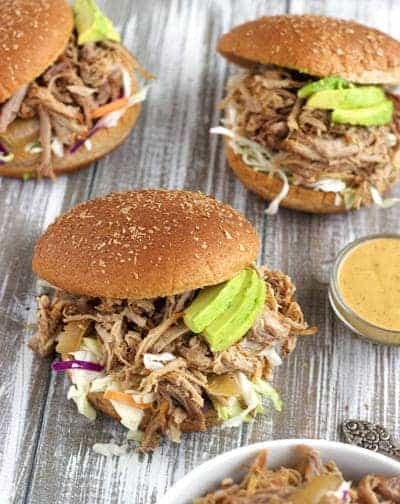 The pulled pork sounds delicious but it’s the avocado ranch sauce that really gets me! Can’t wait to give it a try. Yum. Obsessed with my slow cooker right now!!! Looks great. I actually don’t know! I’m sorry!! Thanks though! looks tasty! 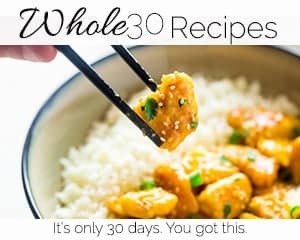 I think this would be a hit with my family.. Pinning it to try soon! I don’t do much pork because I just don’t know how to make it.. This is a great idea. Unfortunately I can’t tell you what will replace it, as the recipe was developed with it. But if you have any hispanic aisle at your grocery store, the adobe sauce comes in small jar and chipotle chilis are packed inside of it. The can reads “chipotle chilis packed in adobo sauce” I hope that helps, thanks!